Freshman Boys – Hello Korea ! Freshman Boys, originally uploaded by Almost-Human. These photos make me cry. 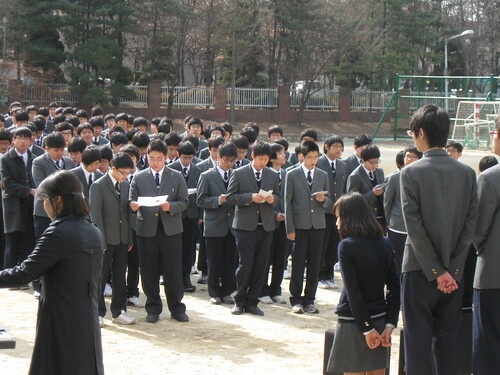 They remind me of the few months when I was attending school in Korea. Things that haven’t change over time are the school yards, and also the students are more disciplined than here. Yes. I imagine that school has not changed much. I might disagree about the discipline, though. The students are more orderly, but I think they might be (guessing) a little influenced by the times and so slightly more rebellious – or at least considering rebellion. Another thing that has not changed much is mother and child. Moms still carry their babies on their backs. Only now the cloth they used to secure the baby is purchased with those click-on adjustable fasteners, and the whole thing is made to hide the woman’s figure, and looks like an apron from the front, hanging almost to the knees.